Note: there are several updates to this page. For the most recent, and all pages on the building, see this link. Groves Chapel, a Wesleyan Methodist chapel dating from the early 1880s, is for sale. It’s at the end of Clarence Street, directly opposite the end of Lowther Street, and once served the Groves area of York, with seating for 800 people. It closed in the 1970s and has since been in health authority ownership. As the front is boarded up (the entrance these days is at the back of the building) it has looked disused for a long while, though it was in use, by the hospital for training and as offices. Apparently redundant now, and on the market. Hard to see an obvious use for a late 19th century chapel by a busy road junction, with parking only available round the back via a narrow road off a side street. I pass it often and tend to take its presence for granted, but passing one November afternoon in 2004 I admired this sunlit side of the building, from Union Terrace. It is Grade II listed, so demolition isn’t likely. I was idly wondering what it could be used for, and imagined a range of things I’d like it to be, including a Co-op mini supermarket (sadly lacking in this part of town, and my preferred brand of mini-supermarket). My partner liked the idea of it being a venue for live music. This chapel remembers it was a chapel, a Methodist chapel, and we’ll have no boozing, gambling or dancing here, thank you very much, it says, in a disapproving way. There are of course former Methodist chapels all over York, in the centre and the suburbs, since reused in different ways, and if they had similar restrictive covenants at one time then they clearly don’t now. 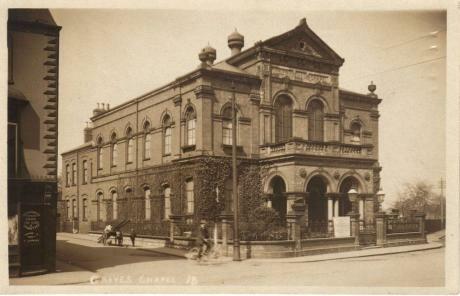 In recent years the Biltmore bar and Oscars have occupied the former chapel in Swinegate, built as the Central Mission Hall. The Banyan Bar opened this year in the former Ebenezer Chapel (more recently part of Borders bookshop) in Little Stonegate. A disused chapel on Goodramgate has shops occupying its ground floor — in recent times it had a betting shop right in the middle of what used to be its entrance. 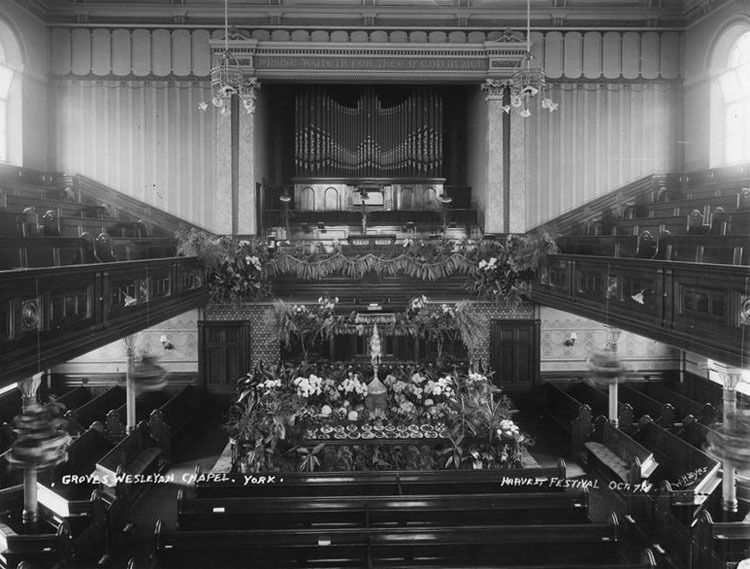 Groves Chapel when it was quite new, around 1900. The photo is probably by William Hayes, a local photographer. Note the railings and wall around the front, since removed, and the open area to the right, then a sports field, where the city’s hospital was built in the 1970s. It’s hard to connect this chapel now to the Groves, the area opposite, the area it was built to serve. In the mid to late 19th century the Groves had filled up with terraced housing (much of it demolished in the 20th century and replaced with blocks of flats, in Penley’s Grove St and its side streets). Between the chapel and the Groves there’s now a busy junction, where Haxby Road, Wigginton Road and Clarence Street meet, and Lowther Street joins directly opposite. 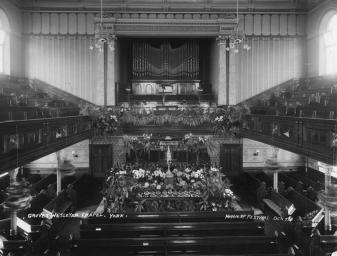 When it was built it beckoned its congregation with its impressive frontage confidently facing Lowther Street, unencumbered. Now the effect is rather lost behind traffic lights, modern railings and pedestrian islands in the middle of a busy road. The Groves Chapel cost £5,721 to build. Now: ‘offers over £435,000 are invited’. Thanks to Mick Phythian on Twitter who alerted me to the fact that the building was for sale. For many months the building displayed an ‘under offer’ sign over its for sale sign. 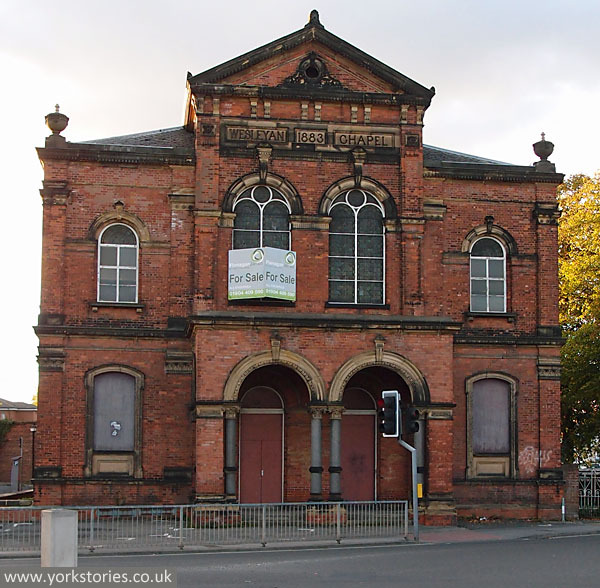 On 7 November 2014 The Press reported ‘£5 million plans unveiled to turn historic York chapel into supermarket and flats‘. Sadly not a Co-op, as I’d hoped, but another Sainsbury’s. Roughly between the Sainsbury’s on Burton Stone Lane and the Sainsbury’s on Bootham, in a kind of triangle of Sainsbury’s stores. Presumably part of the negotiations in the interim involved the removal of the restrictive covenant mentioned above regarding the sale of alcohol. 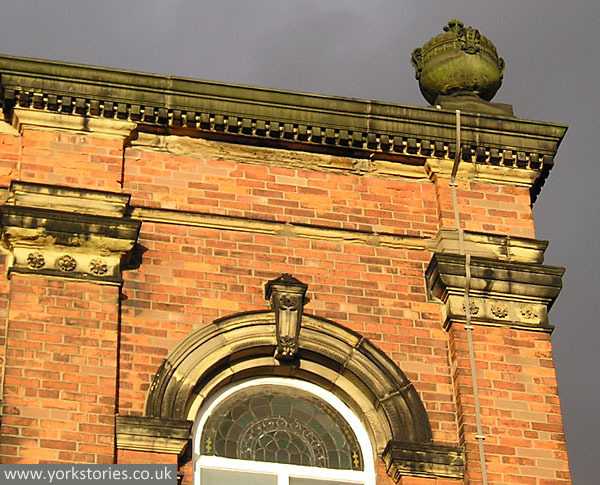 We live immediately behind a Methodist chapel – a 1930s one, it’s vast and largely unused for its original purpose. The elderly congregation rattle around in side on a Sunday morning but it’s become a communal hub and centre for rehearsals for local theatre groups etc. Regularly walk past in the evening to show tunes emanating. It’s hard now to get your head around the size of Methodism in the North of England during the 19th, early 20th century and its subsequent rapid demise. Buildings like the Groves Chapel represent the ‘High Wesleyan’ movement when it had become quite establishment and possibly lost some of its radical raison d’etre, deserting that territory to the Primitive Methodists. They were a mark of misplaced confidence and never really ever filled. The Groves was also an area with a high Irish Catholic population which St Wilfrid’s was built to partly accommodate and sectarian fights were not unheard of. Oddly if you compare the Gothic Revival style of St Wilfs which opened in 1878 and the Groves Chapel you spot similarities. The Methodists were taking on a more explicitly ‘churchy’ style of architecture at the time. Another Methodist Chapel that has relatively recently been converted to flats is Acomb Methodist Church opp Explore library.After years of being a carpet warehouse it was replaced with a modern church further down Front St in the 60s. There was a definite spell where every other redundant chapel seemed to be becoming a carpet warehouse. I’d love Groves Chapel to become some kind of community educational resource centre and meeting – courses, groups, lectures, resources etc utilised by the WEA and the U3A. I like the idea of the self-improving, autodidact strand of Northern Methodism being given a C21st secular makeover. Keith, I have some photos of that chapel as a carpet warehouse – none since though, must call back and see how it looks now it’s residential accommodation. Martyn, you’re right, those chapels are all over Yorkshire aren’t they, from large examples like this to the tiniest village chapels. The village ones are often turned into homes, but I do like to see the ones that haven’t been, often empty and perhaps dilapidated, but a reminder of how important religious belief was to so many people. And also the support churches and chapels offered in other ways, in their communities. I’d love this chapel to find a suitable new use, and did suggest on Twitter, jokingly, but seriously too, that York St John up the road should buy it, which would fit with your idea of educational use, though maybe not the ‘community’ part so much. Would be nice if there was some way of part of it being open to the public, maybe as a cafe or something, for people visiting the hospital alongside. My grandparents got married here in 1919 and years after when health service bought it my dad worked on the maintanance side got the job of clearing out all the pigeons and clearing up after them. Hope you’ve seen the old postcard on another page http://yorkstories.co.uk/where-you-played-as-a-boy-clarence-street/ – of how the street just outside the chapel looked back then. If the building is left empty and falls into disrepair I imagine the pigeons will be back making use of it! I have lead worship in this Church in the 1960/70..and the congregation was good.A friend of mine was married there in 1971 and my wife was converted there.It was a Methodist Circuit hub in those years,and was amalgamated with Monkgate Methodist Church (now Trinity),where I was married in 1975.It had good youth work in those years and was a well loved Church.Many struggled to understand the need for closure,but it was a closure out of strength and not weekness which many of the other comments presume. Thank you for adding this information on its recent history, much appreciated. I hope a suitable use can be found for the building in the future. I have heard that it is only the frontage of the building which has grade listing status (?) – I do hope that this doesn’t put someone off from buying it and doing something useful with it though it obviously needs a lot of care and attention and renovation. It’s almost impossible to envisage and match up the Clarence St. picture on another page with this area now. Hard to reconcile the almost semi rural idyll with the chaos it sees now, not to mention the traffic junction in place cutting the area in half dividing one area from the other. Noticed that the chapel is displaying an ‘Under offer’ sign now – will try to keep an eye on developments. It would be lovely for a York version of Lancaster’s Single Step (wholefood co-operative) and Whaletail cafe (local, organic, fair trade, vegetarian, you name it…). Apart from the sunsets that’s the one thing I’d import lock, stock and barrel from Lancaster to York, because it’s a long walk from this side of town over to Alligator Wholefoods. I say this as a non-hippy and non-vegetarian. I like your idea Beverley! I doubt it will be anything so interesting but I’m interested to see if it progresses from ‘Under Offer’ to ‘Sold’. The Press reports today on plans to turn historic York chapel into supermarket and flats. Yes, a Sainsbury’s. Comments welcome. Another redevelopment apparently enabled by having a Sainsbury’s on the ground floor (as with the White Swan, on Piccadilly). A good thing? Best we could hope for? Anyone else wish it was a Co-op store instead? I know many people have strong feelings on this. We’ll have to see if the petition has any impact. Not sure we need to bring the Arc Light into this, though it does keep being mentioned in online comments I’ve noticed.